Last summer I came up with a list of 50 Summer Activities. I've done some tweaking to the list this year, deleting some things that didn't work for our family and adding some others. The number is a little over 50 now. I've separated them into categories: trips, indoor activities, outdoor activities, and in the kitchen. I gave each category a color and spray painted craft sticks to match. Then I wrote the activities on the correct color sticks and put them in a pot. Now, all we have to do is choose a stick of the appropriate color each day. What a great list you have there! So many wonderful activities. 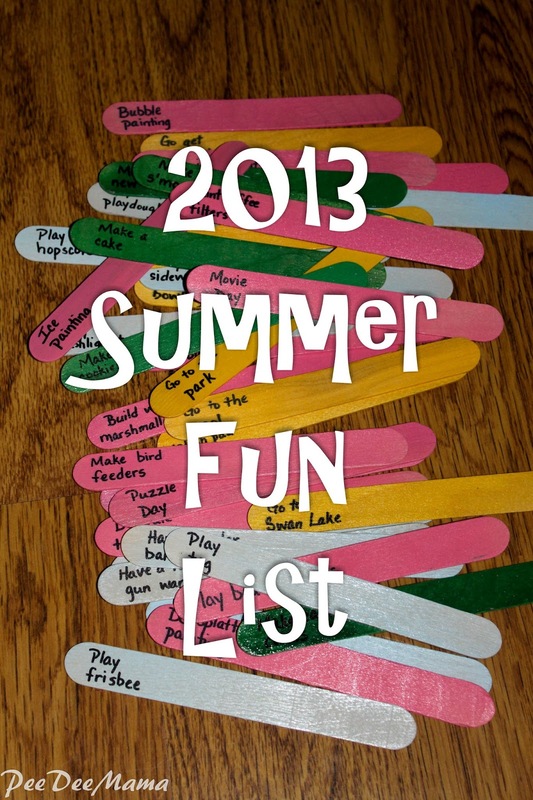 Did you see where Mindy has a Summer Fun Bucket List printable at DenSchool? 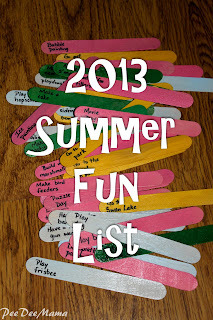 I have never really planned our summer fun (we are a wing-it kind of family) but I am loving this idea. I think my favorite activity on your list is the Squirt Gun Watercolor - I can't wait to see your pictures of that! Wow! Your family has so much fun ahead of you. Thanks for the ideas. Love the ideas! I also like how you split them up based on location. That is a good idea. We did our summer bucket list but just did big things - basically outside of the house. So now we have more to work on!